Here is an example of the famous and special "Wisteria" lamp. Back when this was new it cost $400. 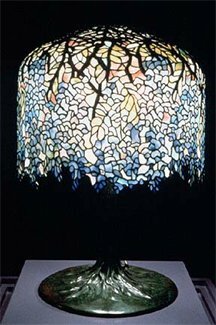 and was one of Tiffany's most expensive lamps in the 1900-1920 time period. It had over 2000 hand cut pieces of glass leaded together. The pastel colored glass shade rests on a "tree trunk" base, model #342.